2 terrorists reported injured after IDF aircraft retaliates for launching of incendiary devices attached to balloons at Israel. 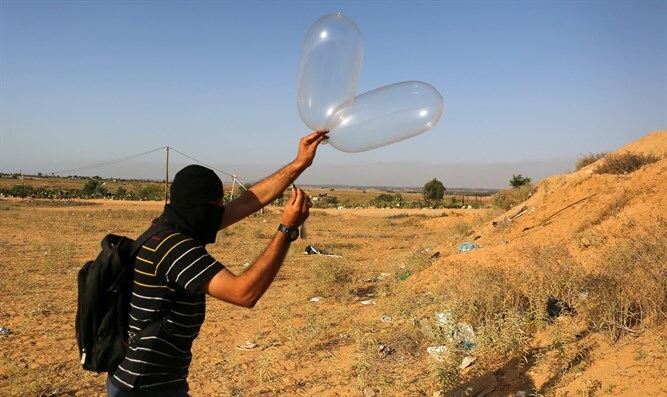 An IDF aircraft fired on a terrorist squad that launched firebombs attached to balloons in the northern Gaza Strip on Friday morning. Arab media reported that two people were wounded in a vehicle which was struck by the fire from the IDF aircraft. Another large-scale demonstration is expected at the Gaza border fence later today. The violence on the Gaza border has decreased in recent weeks after months of riots and arson attacks which culminated in the firing of approximately 200 rockets and mortars at Israel over less than 24 hours in July. On Wednesday, the IDF closed the Erez Crossing between Israel and Gaza after hundreds of Arab rioters in Gaza hurled rocks at the Gaza side of the crossing, damaging the checkpoint. According to a report by the London-based Al-Hayat newspaper, senior Palestinian Authority officials said that PA chairman Mahmoud Abbas has threatened to cut all contact with Israel, should the Jewish state reach a ceasefire agreement with the Hamas terrorist organization which rules the Gaza Strip.